What makes us sick? I was thinking about what you might like to hear about and the idea of illness, or disease just popped in, so here we go. When we become sick, we often experience our worlds shutting down in order for us to heal. This can be a time of reflection upon our disease, or an opportunity to learn more about how health and disease affect our own lives. Of course, there are other reasons for disease, like what we inherit in our genes, what we are exposed to in the air, what we choose to eat, stress and how all of these affect us. I would add few components: thought and energy. Have you ever wondered why one person walks away completely unharmed by a disease that all are exposed to and everyone else gets sick? Or how about twins with the same biological makeup, living apart, each having specific predispositions and one staying healthy and the other facing all kinds of disease? I would venture to say it is how we THINK about disease and how we FEEL about it that can have an amazing effect on the impact and force of the illness or wellness in our lives. It is the old adage, what you focus upon is what brings the results, or what you resist, persists-resistance defined as the amount of time and attention YOU decide to give to the illness. Another option towards the healing of disease is to recognize that it is present to help you figure out something about YOU. That your natural state is one of well-being and your greatest desire is to be there. To LOOK, IMAGINE and FEEL yourself being WELL. 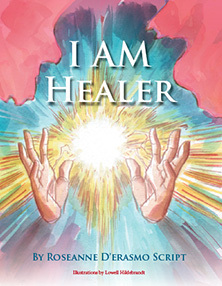 To LEARN about the power of COLOR and LIGHT to help yourself HEAL . Through BREATH and POSITIVE thought you can be more in alignment with your source energy, thereby feeling healthy and well.